We've seen phones with lots of crazy features, but in my opinion BenQ's fat-measuring phone beats them all. 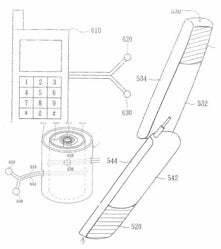 The alleged phone keeps track of your pudge by shooting out a micro-current that travels through your body. When you touch two separate electrodes on the phone, a special chip will measure the electrical signal and before you know it, you'll be dropping those Twinkies in no time flat. I think the idea is pretty far-fetched—the last thing anyone wants is a phone telling them when they've had one too many Doritos.